First Impression: Yay! We’re done making this video! Second Impression: We can eat cake now! This is another color-soaked DVD from the series whose titles cause me to exclaim with delight, “Sweet Fancy Moses!” These videos have everything. A studio decorated with saris and Christmas lights, a live bongo player, exposed brick walls, enthusiastic backup dancers, an unused hula hoop, self-affirming mantras, and two goofy co-hosts that genuinely like what they are doing. The routine is fast, with lots of quick footwork. They don’t stop to break down any of the steps, so for my part, it’s some dangerous flailing. I’m not worried, because per the Yoga Booty Ballet signature style, they loop around back to the beginning after they add on each new piece. So through repetition, you eventually figure out the whole sequence. And if not, that’s okay. I’m in my living room and no one is watching. I made sure of this when I put a Band-Aid over the camera lens on my laptop. Gillian and Teigh call out their cute little nickname for each move a beat before, so you know what’s coming up. There’s one they call The Hand Thing, and if you’ve done this video, that’s exactly what you would call it too. Turns out, Hip Hop Abs is a bit of a misnomer for this workout. 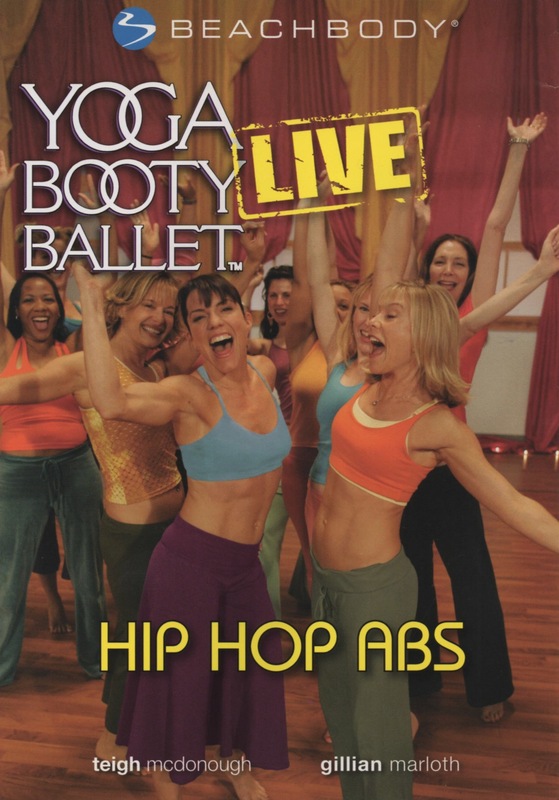 It’s actually Hip Hop, then Abs. What a relief. I was worried my TV boyfriend, Shaun T., would get jealous that I was working out with his competitor, and he’d force me to choose. So anyway, when we get down on the floor to do Abs, we incorporate a small dodgeball to increase the difficulty of the crunches. I hear Gillian say, “Look at those guys throwing their balls around. Typical males.” I wasn’t sure what she meant, until I notice that the two male participants are doing a synchronized dodgeball-toss to each other at the top of their crunch. Just for funsies. This video really does have everything. This entry was posted in Reviews and tagged 45 minutes, abs, calisthenics, cardio, challenging, dance, exotic, fun, live music, talky, trendy, varied routines, yoga. Bookmark the permalink.